Here at Intrepid English, we never forget how lucky we are to call Edinburgh 'home'. There's a wealth of culture, scenery, history around the city - if you're visiting for just a few days trying to choose what to fit in can be a challenge. Most tourists visiting Scotland's capital city will know to check out Edinburgh Castle. Towering above the city, it's the first stop on everyone's Edinburgh to-do list. It's the perfect place to start exploring, but there is so much more to see. 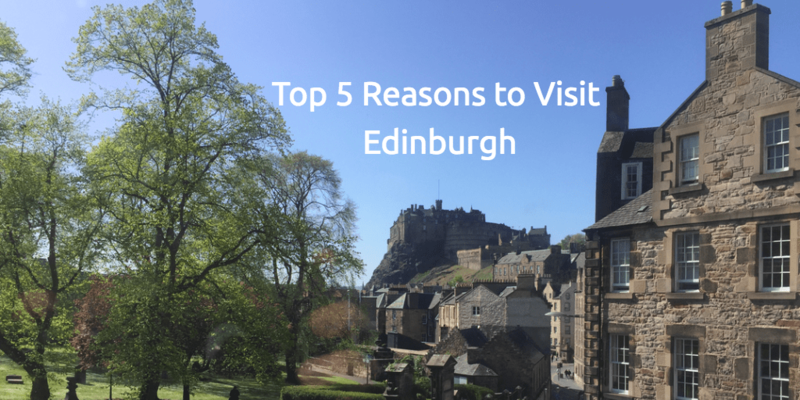 Here are my top 5 must-see spots in Edinburgh. Overlooking the city and providing incredible views of Edinburgh and over to the Kingdom of Fife, Arthur's Seat definitely deserves to be on this list. It sits in the middle of the city and is easily accessible by car or on foot. You can start your walk at the bottom of the Royal Mile, where you'll also find the Scottish Parliament and the Palace of Holyrood. From there, it's about a 30-minute walk to the top and you'll get to see the city from all angles on your way. I recommend wearing sensible shoes with good grip – it can get slippery up there if it’s raining. What makes this walk even better? You'll get the best views in the city, wonderful photos, and you can tell your friends and family you've climbed to the top of an extinct volcano! Having been named the #1 Attraction in the UK, it’s easy to see why Britannia is on my list. This yacht has travelled over 1 million miles and served as a residence, reception venue and holiday home for Her Majesty The Queen. Having served the Royal Family for 44 years, it is now berthed at Leith where you have the opportunity to explore her decks, discover what life was like on board, and learn about the Royal Family. Did you know, for example, that its signature blue paint was chosen to match one of The Queen and Prince Phillip’s wedding gifts? The Royal Mile runs from Edinburgh Castle down to the Palace of Holyrood. For this reason, taking a stroll down The Royal Mile is an excellent activity straight after your visit to Edinburgh Castle – step outside of the castle and you’re at the start line! With its cobbled streets, narrow closes and historical buildings, this part of the city will give you many glimpses of the past and is a walk you won’t want to miss. Learn about traditional arts and culture at the Scottish Storytelling Centre, admire the architecture of St Giles Cathedral, brave Mary King’s Close, spot the plaque dedicated to Robert Burns, check out Parliament Square with all its historic monuments, and see the controversially designed Scottish Parliament building. These are just a few examples of what you’ll find along the Royal Mile…fortunately, there are lots of great places on the mile for food and drinks to fuel your explorations! No experience of Edinburgh is complete without delving into the treasures at the National Museum of Scotland. Once you’ve marvelled at the interior from the Grand Gallery, there’s a wealth of history for you to explore. If it’s Scottish history you’re looking for, check out Scottish galleries where you can find Celtic, Viking and Roman artefacts. You can even see some of Mary, Queen of Scots’ belongings, including her jewellery. The National Museum also houses some impressive exhibitions such as the Natural Gallery, complete with a giant T-Rex skeleton cast. Don’t miss the chiming of the Millennium Clock at the top of each hour, I won’t spoil the surprise but it’s quite unique! The museum is an interactive space that I wholeheartedly recommend visiting…where else can you run in a human-sized hamster wheel? Ok, so I'm cheating a little here by combining two things…but Victoria Street is one of the ways you can access the Grassmarket so it makes sense to merge them into one experience. Situated just off The Royal Mile, Victoria Street is one of the most picturesque spots in Edinburgh and will give you some excellent photo opportunities. It is said to be the inspiration for Diagon Alley in the Harry Potter series and a Potter-themed shop recently opened there too. It’s home to some beautiful independent retailers selling second-hand books, clothing, fancy cheese, artwork, bacon rolls and French patisserie. It’s a lovely stroll down Victoria Street onto the Grassmarket where you can find lots of wonderful places to eat, drink and take in the incredible view of Edinburgh Castle towering above you. I would recommend Mary’s Milk Bar for an ice-cream treat to top up your energy levels! Would you like to visit the beautiful city of Edinburgh? If you would like to join us for the next Intensive English City Tour in September 2018, please email us at Intrepid English to find out more. Details will be released soon, so make sure you sign up to our newsletter to get all the latest news and English language tips straight to your inbox. This blog was written by Intrepid English teacher, Gemma. Find out more about Gemma on her Intrepid English Teacher profile page.